Thanks for your interest. This version of Young America does require less tools than the framed model. Everything is described in full detail in the forthcoming Book describing construction of both versions. It should be out soon. Keep an eye on SeaWatchBooks. 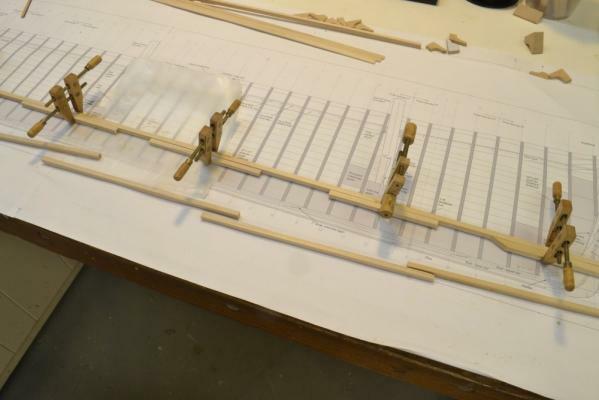 I have just finished planking the hull, but I want to work through the sequence so I will describe that later. It was a breeze - very easy with very good results. I am very pleased with the POB framing method used. I could be adapted to any model. Just one more question to go: You are using pine spacers; wouls bass-wood do as well? 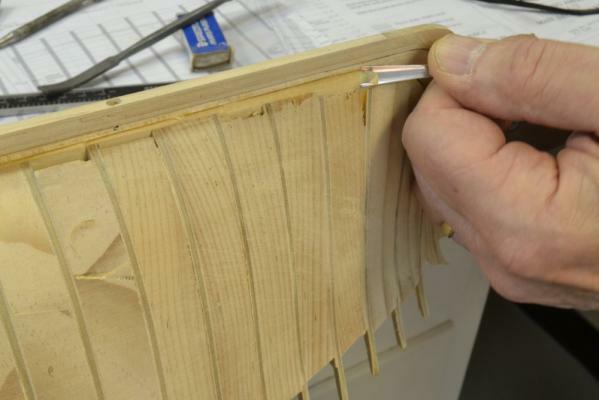 And if you are talking about aircraft grade plywood: How many layers does such wood have in the USA?? Thank you and god speed with your projects. Ed, will your book be covering the rigging and masting or just the hull construction? Peter, I believe basswood would work as well, but it is harder than white or sugar pine. I believe it is more expensive than sugar pine, but I have not checked that. I usually have some 1" x 8" clear sugar pine on hand, so that was convenient to use. Unfortunately, the Radiata was also too available - on hand from an earlier carpentry project. I am never quite satisfied with wood from the "big box" home centers and prefer to go to a real lumberyard if one can be found. I believe clear white cedar would also be good for this - although this "pencil wood" is sometimes hard to find. 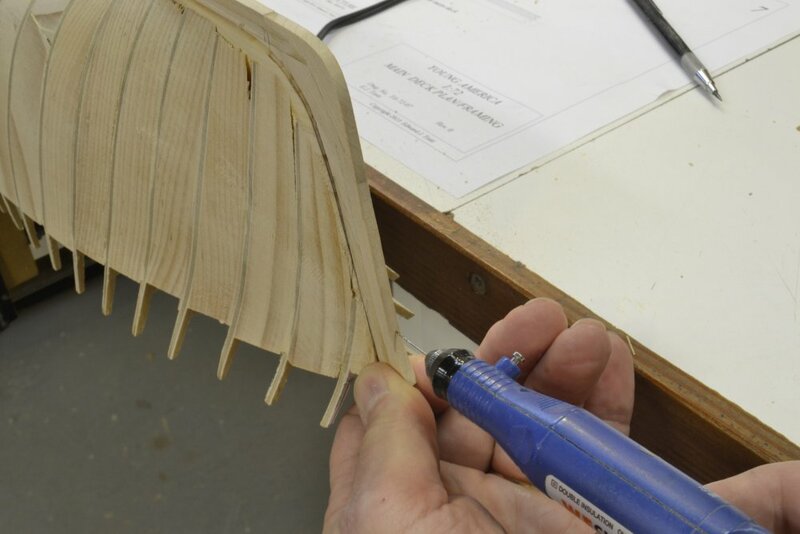 The softness of the spacers makes cutting the 3/4" thickness on the scroll saw easy. Also, later it will facilitate clamping on the planking - I used thumb tacks. 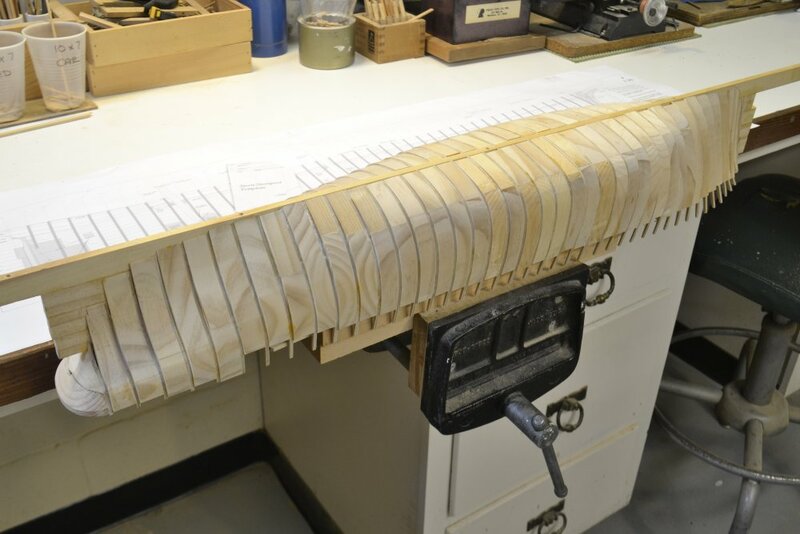 The aircraft grade plywood I used was 3/32" three-ply birch. The plys are at right angles. I aligned the outer ply grain vertically to make the top timbers stronger. In all of the bulkheads I found zero voids and zero delaminations - well worth the price. I ordered it online - two 24" x 48" pieces - more than enough. Rob, thanks for your continued interest in the books. Hopefully you will not have long to wait. Volume I covers the hull construction for both the framed and POB versions. It describes construction to about the time of launch. We expect Volume II to cover fitting out and rigging. This should include the above deck facilities like deck houses, capstans, wheel, ladders, pumps etc - then masting and rigging. In volume I, construction methods for both versions converge to common descriptions. I expect rigging to be scale neutral, but I am just putting together the way that will be done. Ed - I hope you'll be autographing copies of the book at the NRG Conference. I'm looking forward to meeting you there. I am hoping so too. If the book is out in time, I hope to be there with both Young America models. We'll keep our fingers crossed. I'm a huge fan and just picked up your two Naiad books. I'm basically a newbie at model ship building, but I have extensive experience with modeling and fine woodworking. I think the hull building technique your showing here is great. 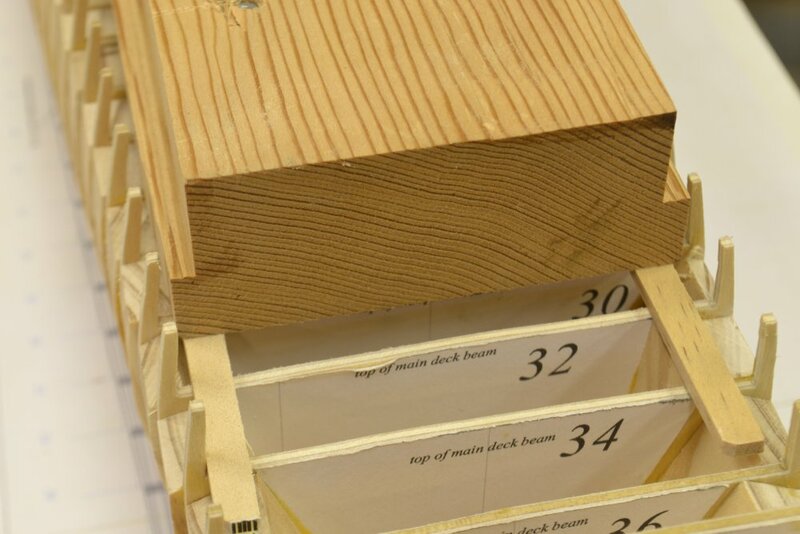 My question involves glueing the plans to the wood and then glueing more wood to that surface. I learned a long time ago a trick from an old wood turner. If he wanted to make a half balustrade, he would take two pieces of stock and glue them together with a piece of paper between them. He would then turn the balustrade normally. When finished would dampen the joint between the halves along the paper and easily split them apart. My question is, won't all the wood/paper/wood present some potential weakness and splitting problems down the road? I'm looking forward to hearing your thoughts. 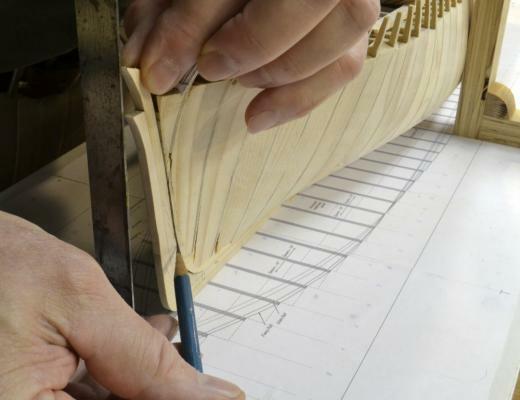 besides: there is no paper between the keel and the frames. You are absolutely right. If left on the bulkheads, the paper would prevent a good bond with the spacers and the hull would be weak. 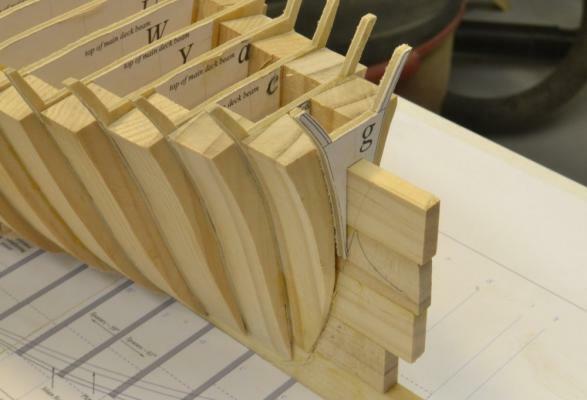 The glue joints between the plywood bulkheads and the spacers is the main source of hull strength. The notch over the spine is glued but that does not provide much strength. It is primarily for alignment and setting the heights of the frames. 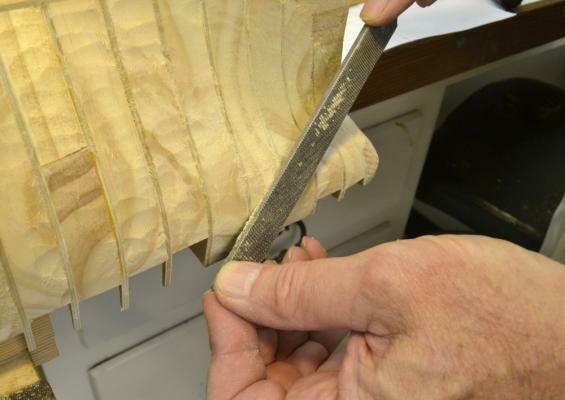 I remove the paper wherever there is a glue joint, for example in the area of every spacer. When locating the spacer on the bulkhead I scribe a line through the pattern, then wet the part to be removed and rub it off. Using school glue paste sticks allows this simple removal. A damp paper towel serves to clean off any residue that might interfere with the glue. Because I scribe the line right at the edge of most spacers, it may appear that the spacers are glued to the paper - not so. I leave the rest of the patterns on so I can quickly identify the frame numbers and use the pattern centerlines. 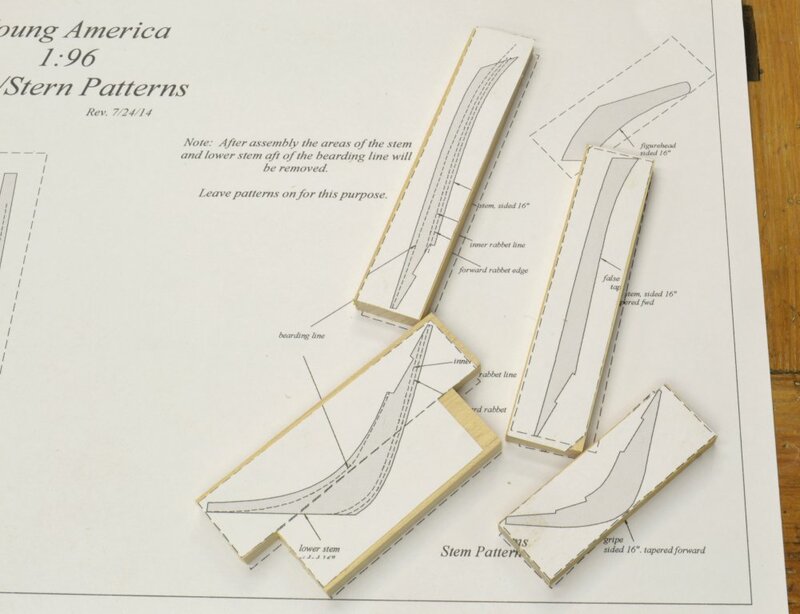 I do use the technique you describe for holding pieces together to allow identical cutting, but for these small parts I do not bother with the paper. The school glue is enough. 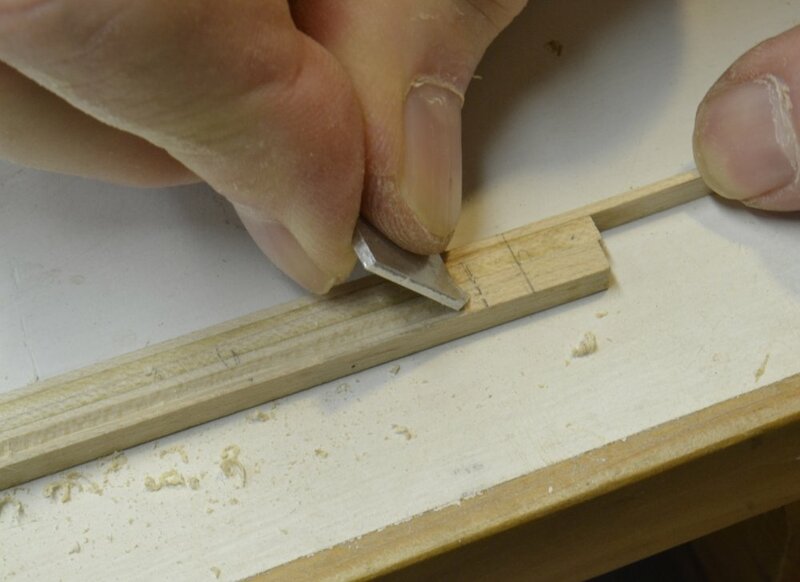 It might not be enough for turning, but works well for matched cutting on the scroll saw. I will show that when I make the carrick bits and may have shown it for those parts on the framed model. Jan, what you say about planking adding strength is quite true. When glued to the outside of the hull the planking reinforces the plywood/spacer joints and also any plywood delamination. Good point. By the way, let just add a point here lest someone wants to try this method using rubber cement to secure paper patterns. 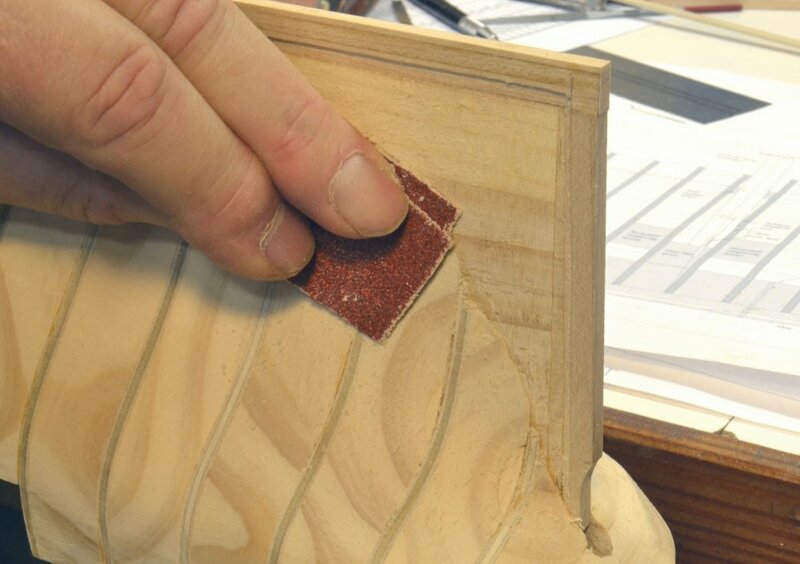 The rubber cement residue that would be left on the plywood surface when the paper is removed would prevent the absorption of the wood glue that is critical to the joint. Even with solvent cleaning of the glued area this would be a concern to me. Those that follow my work know that I am no fan of rubber cement. This is but one reason. As with the stern, the bow required some solid support forward of the last bulkhead. The first picture shows the bow before the last bulkhead at frame g had been set. 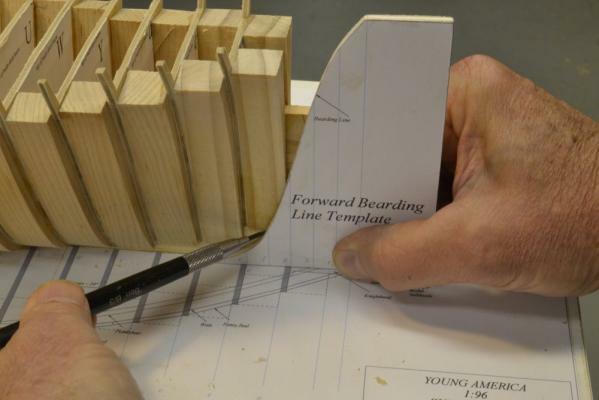 The line of the stem was first roughly drawn on the hull using a template as shown below. This template was used on both sides by marking one of its frame lines on the opposite side. The line is rough at this stage – slightly on the full side. This will later be adjusted and the stem/keel assembly fit over this. In the next picture the forward spacer is being shaved back below the bearding line. 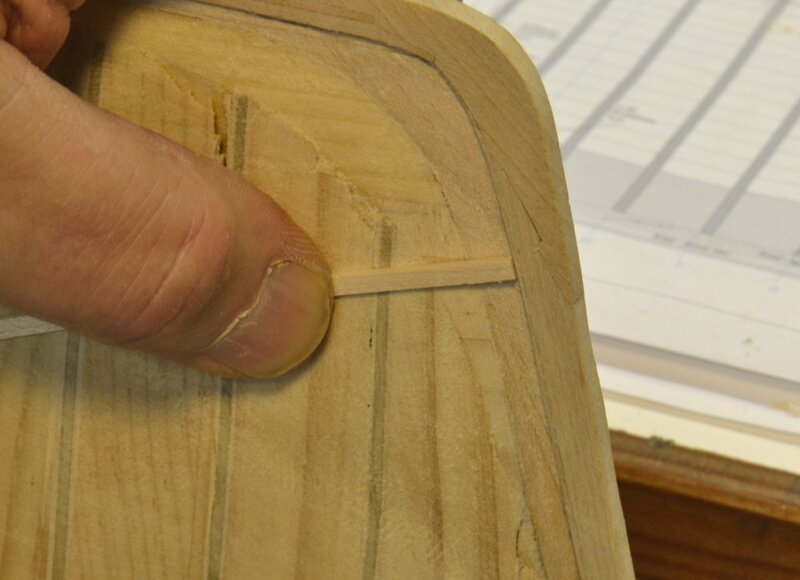 This allows the template to be more accurately placed flat on the deadwood for more accurate marking. The extreme bevel of this last spacer can be seen in the next picture, taken after setting bulkhead g. There is a lot of wood to remove from these forward spacers. In the next picture a small pine block is being fitted between bulkhead g and the spine with its lower face on the bearding line.. The breadth of the hull at the bearding line is the breadth of the deadwood – 16” on this ship. The spine is larger than this at ¼” = 24”. This leaves some allowance for final fairing. These forward pieces are temporary, to be removed and replaced later with the knightheads and stem pieces. Their purpose at this stage is to protect the plywood of bulkhead g from being damaged when the forward hull is fared. I can definitely see where this method will make for a strong and true assembly during fairing and planking. Very nice. 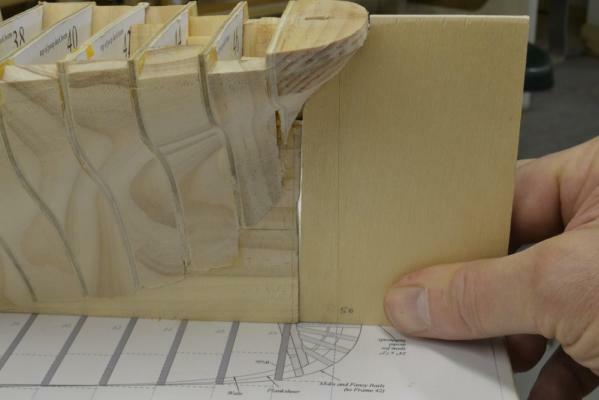 The hull of the model is very strong and solid – except for the fragile plywood toptimbers. Since there is a lot of work to do with the hull inverted, some form of robust support was needed - to support the hull for heavy work like fairing, but at the same time to keep the toptimbers protected. A heavy wooden block that could be securely fastened in a vice was made and attached to the hull for this purpose. It is shown screwed down to the “deck beams” in the first picture. To secure the block to the hull a pair supporting spacers were fitted and glued between bulkheads – away from later facilities. These are shown glued and clamped in the next picture. Four long wood screws were used to fasten the block to these supports. 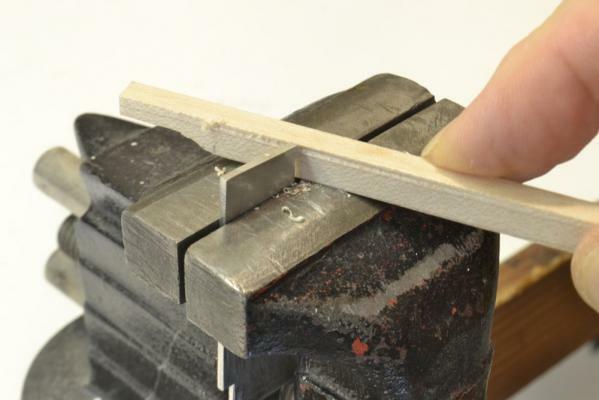 The wood block was rabbeted along the sides as shown below to keep the toptimbers clear of the vise jaws. Two strips of wood were used to keep the block from rocking on the round up of the deck. The next picture shows the hull securely clamped in a bench level woodworking vise ready for the next steps. Removal of the excess spine was the first of these steps. 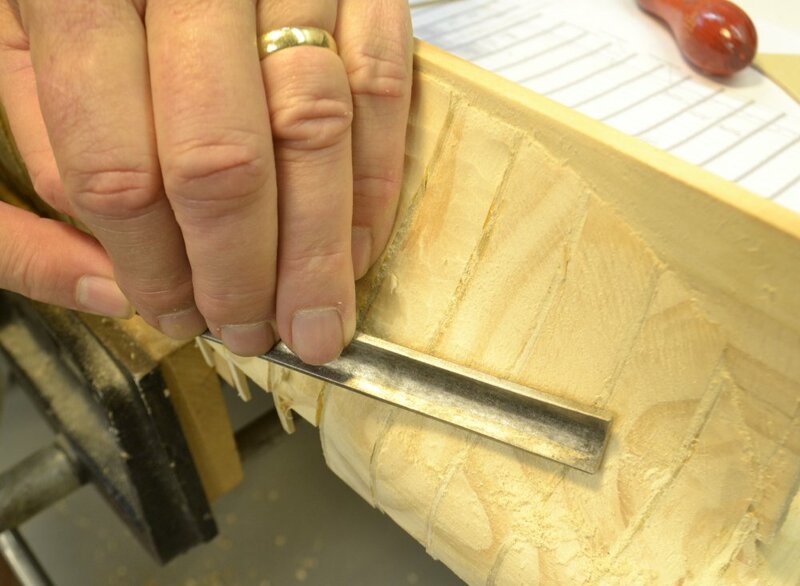 In the next picture a coping saw is being used to cut just outside of the bearding line previously marked on the forward part of the hull. 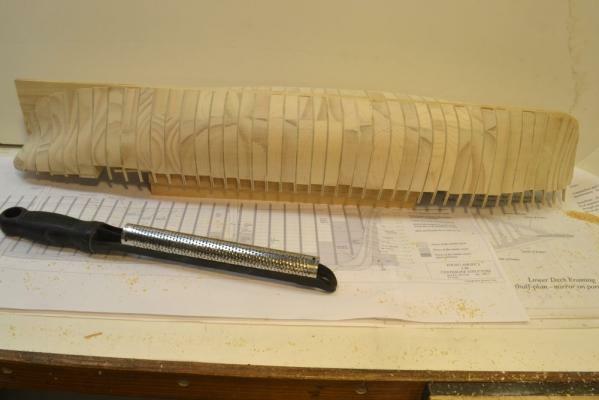 The spine aft of the post was also removed by cutting on a line marked from a stern template. Both these cuts are rough at this stage. After this work the hull was ready for fairing – to be covered in the next parts. Looking at your build takes me back many years to this same stage in my Lightning model. Before I closed up the hull I powdered the inside with insecticide. I felt it to be important, especially here in Florida where we grow them big and many as well as tiny and terrible. Later when I went to step the masts I found some powder partially filling the mast step for the mizzen. I made mini vacuum by taping a soda stray on the end of my shop vac and hosed the step out. 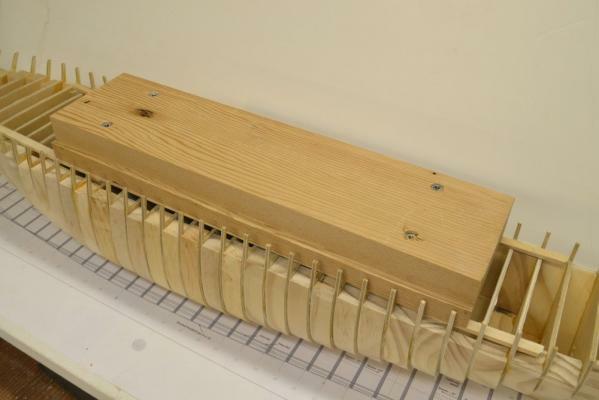 Do you know the type of pine you used for the clamping blocks. I have some now but I'm running out and I'm nor sure what it is. I like it quite a bit. I find it easily as workable as bass wood, but still a bit harder and stiffer. Thanks. There are two different species of pine used on my POB model - sugar pine and radiata pine. I used what I had available from my collection of leftover stock. 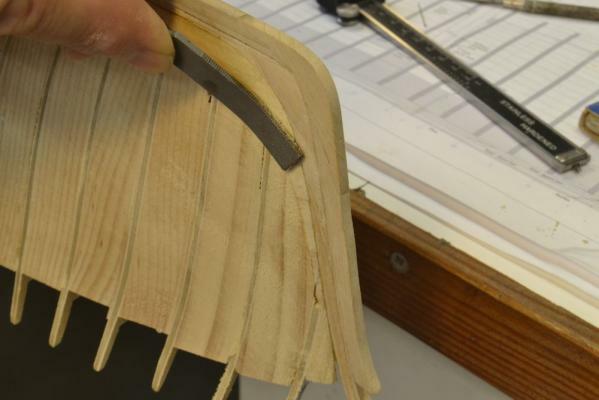 As I mentioned earlier, the sugar pine is much preferred for its uniform softness vs. the radiata which has hard, darker growth rings that make shaping and especially pinning planks somewhat more difficult. Radiata pine (pinus radiata) is a form of Monterey pine grown in certain areas of southern California and Baja Mexico. It is highly cultivated for various construction uses and can be found in home centers like Home Depot or Lowes in the form of clear boards. It is usually labelled Radiata. I probably bought this for some carpentry project and used it on the model for convenience. It serves the purpose but is not ideal. 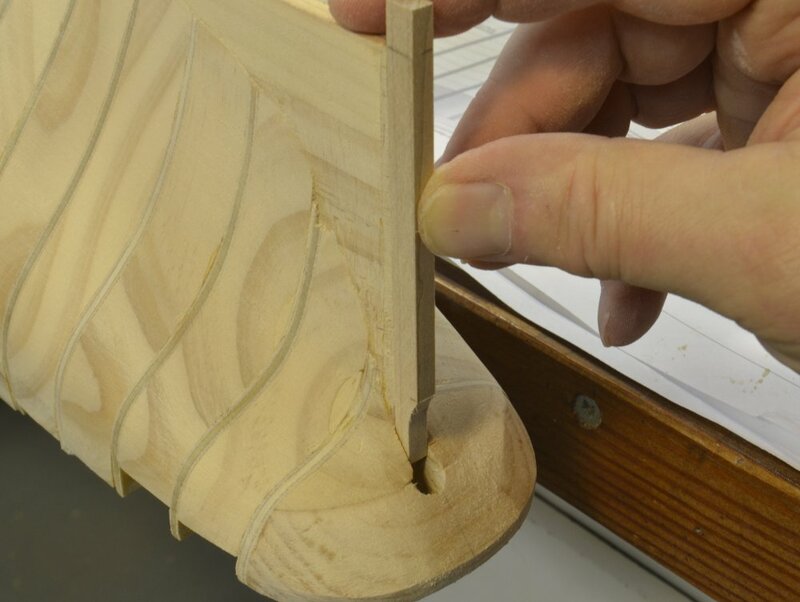 In addition to the hard rings, dimensional stability is variable and planks sometimes perform contortions before long - not too much of a problem on small pieces, but shrinkage could be. Species identification of your available stock may be difficult. There are many pine species. Given your location, it may be eastern white pine - a common species in the northeastern US. I would not hesitate using this if clear and straight grained. As seen in some of the previous photos, there is quite a bit of wood to be removed from the spacers used in this framing method. It is much like working on a solid lift type hull, but the numerous bulkheads make it very easy to accurately duplicate the original shape by merely removing wood down the each of the bulkheads then finishing it off to a smooth fair surface. My natural response to this work was to use available carving tools to remove wood between bulkheads, followed by rasping and sanding. 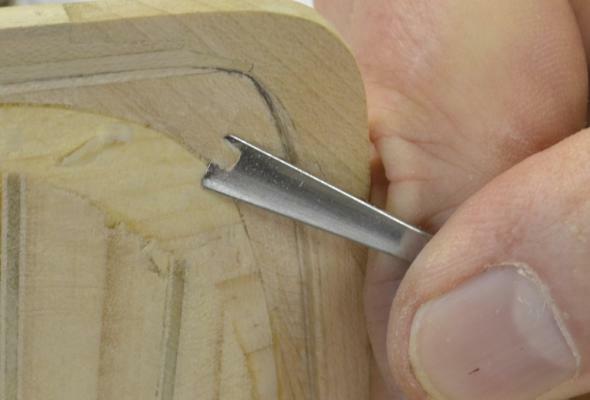 This is a good method to use if you have the tools and the ability to keep then razor-sharp. 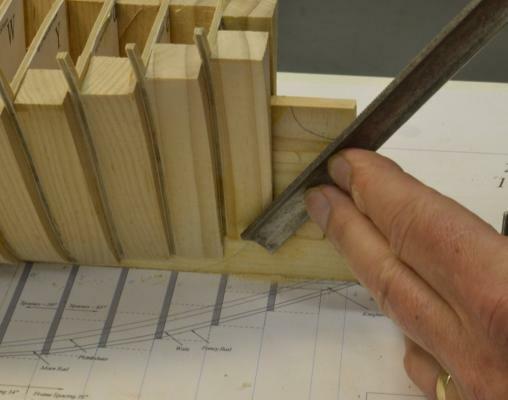 However, although I used this method on the starboard side, I wanted to offer a simpler process, using less expensive tools on the opposite side. That second method will be described in the next part. The first picture shows shavings being pared off the hull using a shallow curved gouge with hand pressure. A solid anchoring of the hull is essential to allow two hands for this work. The sharp gouge easily removes thin cross-grain shavings. 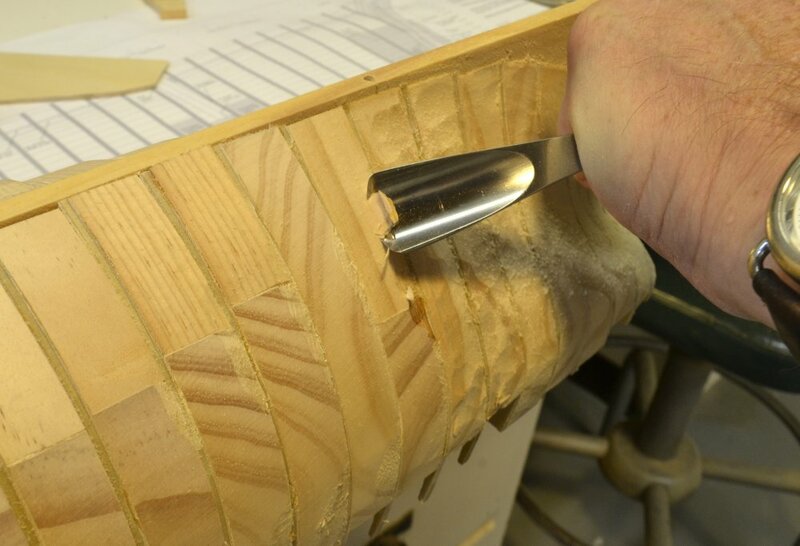 In the next picture a deeper gouge is being used with a mallet to chip off larger pieces of the extreme bevels near the stern. Again, this requires the hull to be firmly secured. 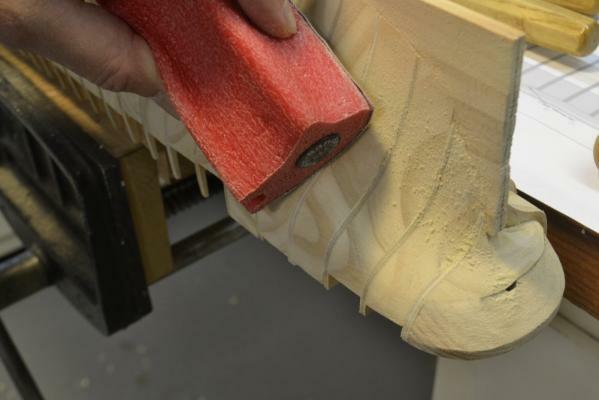 After paring with the gouges the shape was further smoothed out with fine-cut rasps. The curved rasp in the next picture was used on the concave surfaces. A flat rasp was used on the convex hull surfaces as shown in the next picture. The rasps used here are fine-cut Iwasaki® carving rasps. This is not a job for the coarse hardware-store variety. You can pay almost anything for a rasp. These are good quality and reasonably priced. 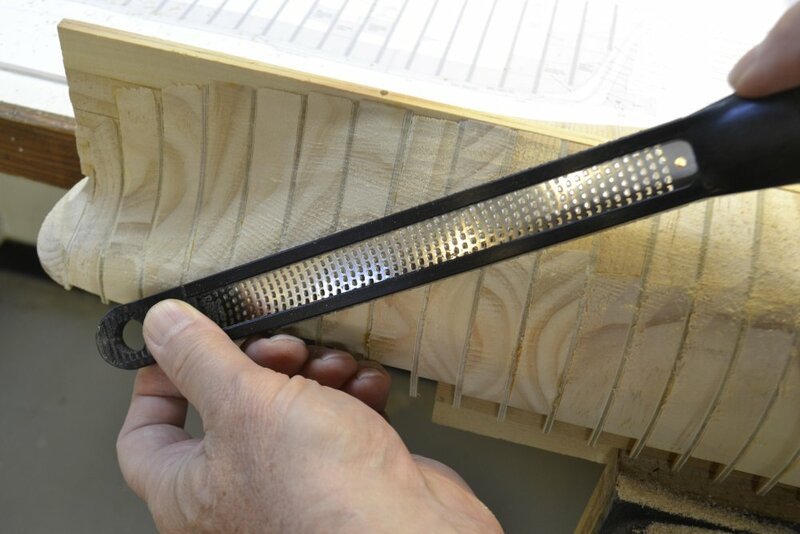 The last step on this side was done with 120-grit sandpaper on Softsander® pads – as shown in the next two pictures. 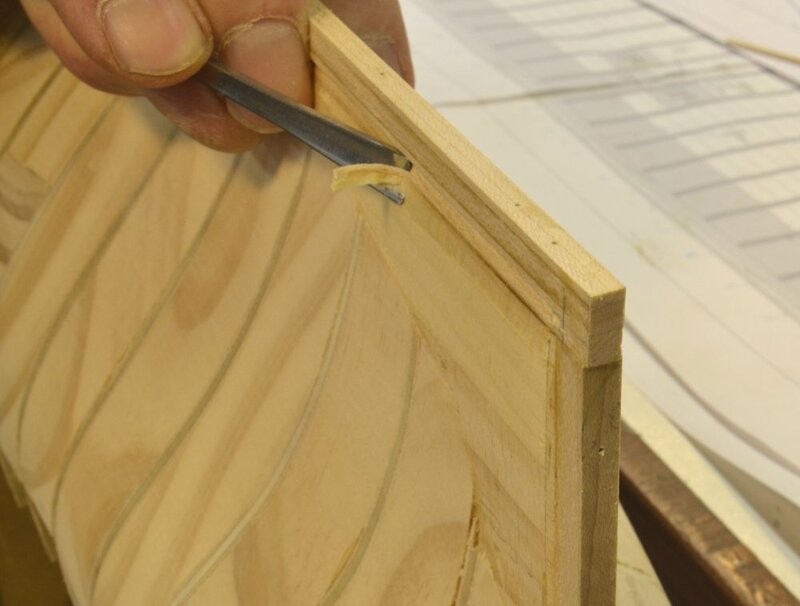 The rasping and sanding bevel the plywood bulkheads as necessary to leave a smooth surface. This involves trimming only the small side of the plywood shapes. This point is indicated by feel as well as sight. The above picture shows the finished and unbeveled sides and gives an idea of the amounts of wood to be removed. This work went pretty fast, taking less than 2 hours for this side of the hull. A second method will be shown on the port side in the next part. Thanks for sharing your techniques Ed. It looks like this same method would work as well for a solid-hull build as well. I hand carved a 1/96 scale Cutty Sark out of a 6x6 piece of redwood. I scaled up the hull from the smaller Revell model of the same. I then planked the carving. I made wood templates for the hull carving...similar to a shaped guage. It worked well and the redwood carved very easily. I believe with a solid hull it is customary to work with external templates or to waterlines on lifts - or both. Much depends on the accuracy you wish to achieve. 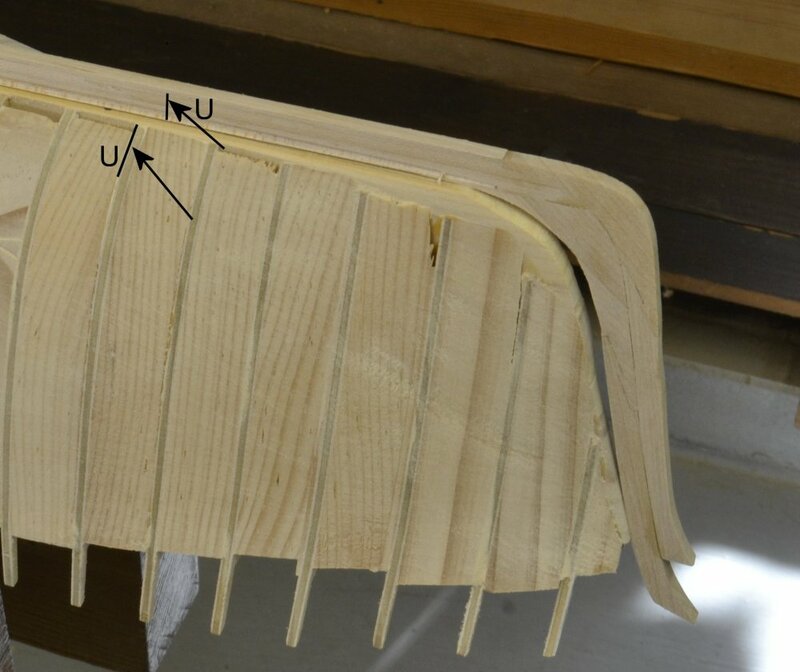 In the method shown, the accuracy is obtained by fairing to the precisely shaped plywood bulkheads. With one of these at each station - 41 total - a very accurate hull shape is quite easily obtained. Using external templates is a more tedious process and requires templates to be squared up when paced against the side. Using lifts alone requires interpolation of the shapes between waterlines. I did this once, many years ago and found precision difficult to achieve. Also, I am not using any filler material on the wood. For those who may have missed it, this POB model was initially built for demo purposes for Volume I of the book – to provide a smaller, simpler version for those less interested in the fully-framed larger model. I have since been taking the construction further than planned and do not yet know how far that will go, but the project has been interesting and I am very pleased with the POB framing method used and the results so far. Since the model is supposed to be simpler and more interesting for less experienced modelers, I tried to use fewer and simpler tools where possible. 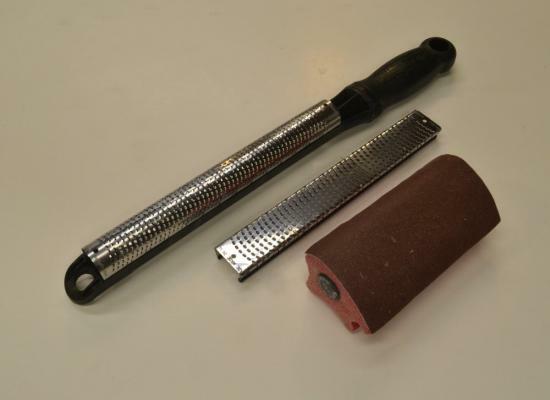 I do not put the carving gouges or the rasps used in the last part – or the necessary sharpening stones - in that category. So, for the port side of the hull I used some much less expensive and easy to use tools. These are shown in the first picture. The primary tool here is the Microplane®. This tool is inexpensive and very easy to use. It worked very well on the pine of the spacers. The tool comes with both flat and curved blades. These can be fitted to allow either push or pull strokes. I used mainly pull strokes that seemed easier to control. The next picture shows the curved blade being used on the convex part of the stern. In the next picture the flat blade is being used on a convex surface. 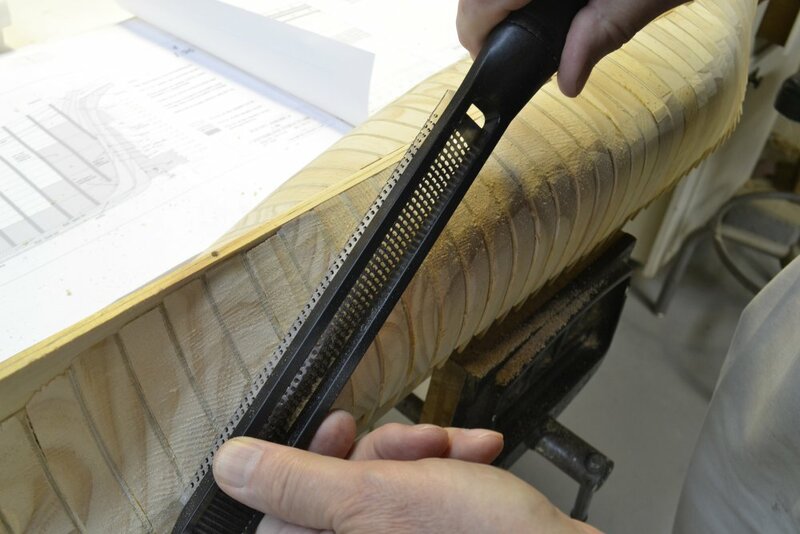 When the spacer material was removed, the final surface was produced with the Softsander® as before using 120-grit paper. 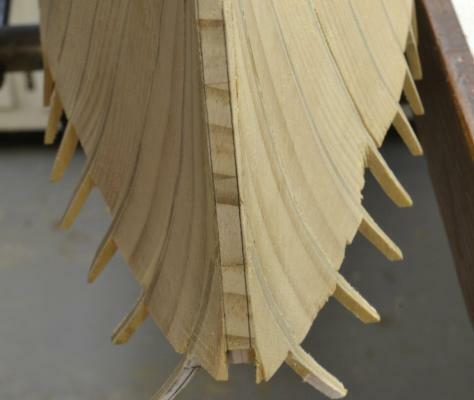 In the next picture the work is just about finished and I am appreciating the smooth feel of the faired hull. As with the starboard side, this side also took less than 2 hours work. 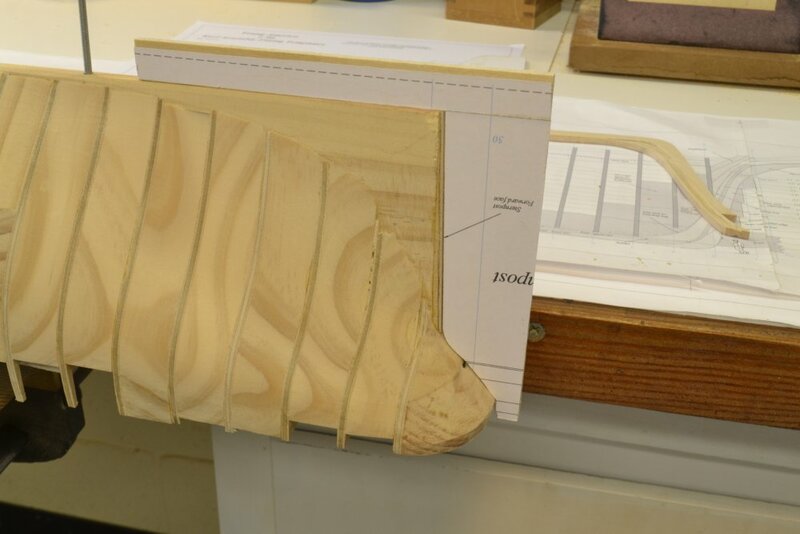 The next picture shows the hull out of the vise and the curved Microplane®. The next picture shows the hull next to its big sister. 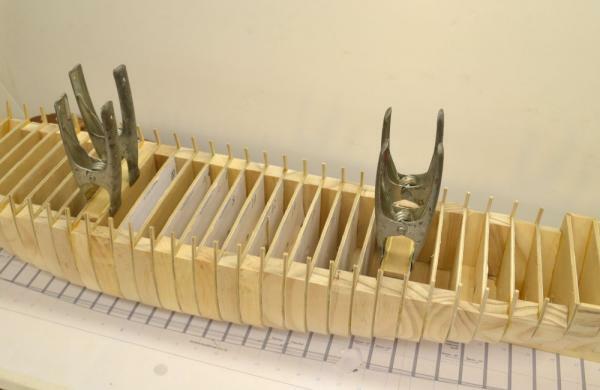 The next step is to make and install the keel/stem/sternpost on to the POB hull. Thanks for sharing your techniques and tools Ed. The stem assembly, keel and sternpost on the POB model are virtually identical to their counterparts on the framed model except for scale and the deletion of a few unnecessary internal structural parts. 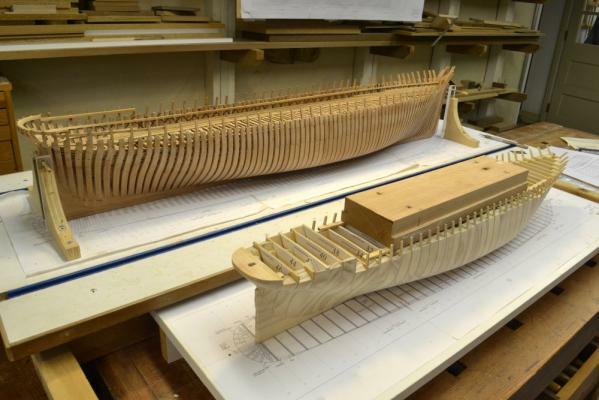 Unlike the framed version that started construction with this work, on the POB model they were made and installed after the hull was shaped. 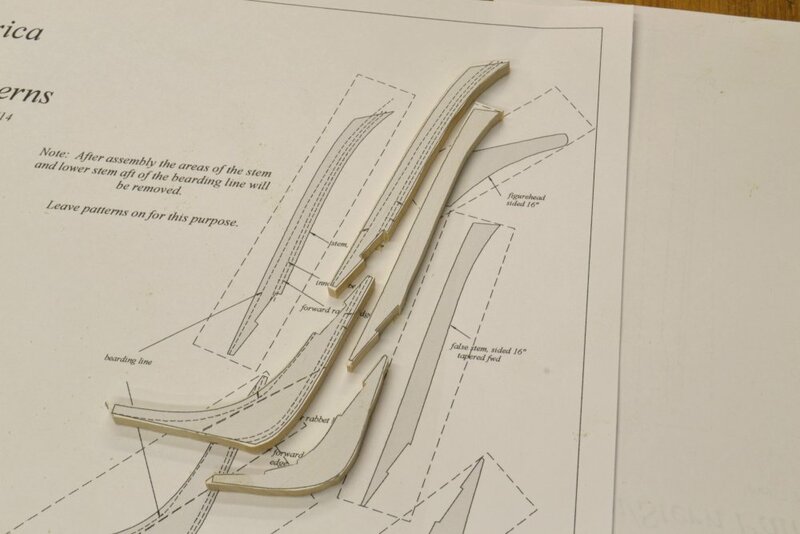 In keeping with the concept of simpler tools and readily available materials for this version, scale members were all cut from ¾” (4/4) material. 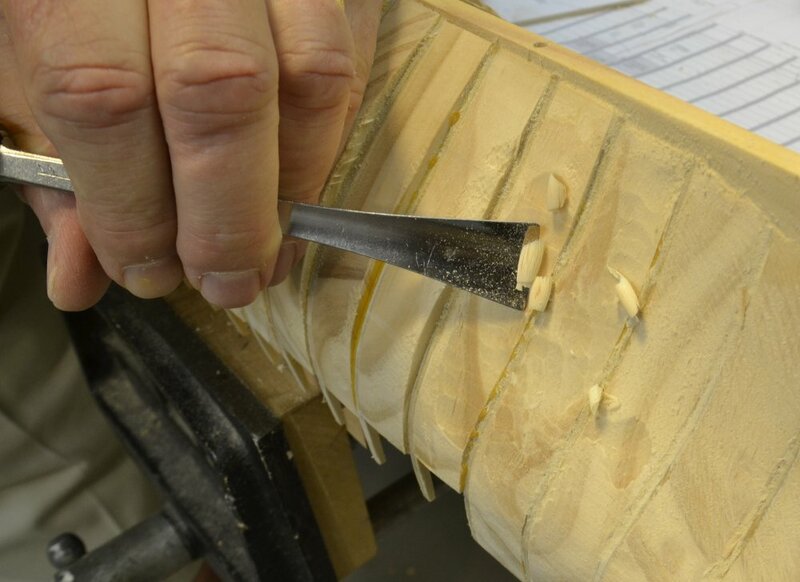 For the stem/keel/sternpost, hard maple was used – with pieces selected for straight grain. Becaused of its visible grain pattern I would only use maple where work will be painted or metal sheathed. The POB model did not require the thickness sander or band saw. Members were sized using circular saws. 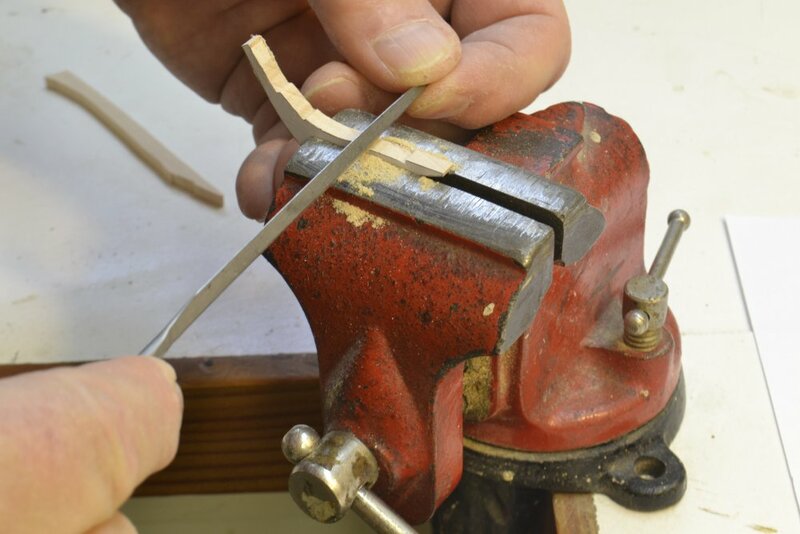 If ¾” hardwood can be ripped on an available 4” model circular saw, ripping stock to required dimensions is just a matter of setting the rip fence and cutting. On the full-sized (10”) table saw that I used, a different method was adopted. 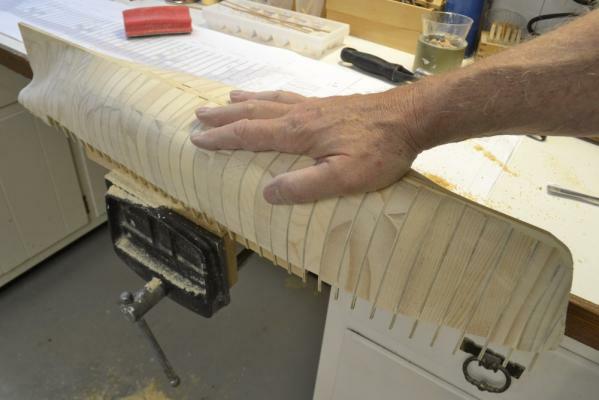 The first picture shows stock for the 16” wide keel about to be ripped off of a piece of 3/4” maple. 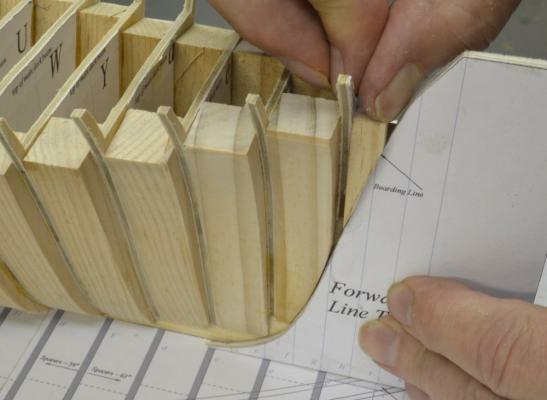 Although cutting sized strips away from the rip fence as shown takes a bit more setup time, it is much safer and eliminates damage to small thicknesses left between the fence and the blade. It also avoids having them come out of the saw at high velocity. The blade in the picture is an ultra-thin kerf (.080"), 40-tooth carbide blade that leaves a very clean surface on the strip. 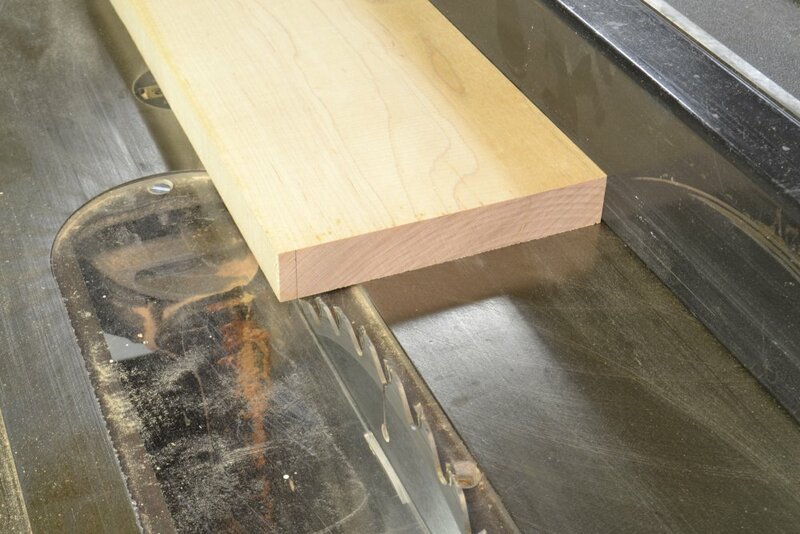 The Plexiglas® table insert was specially made for close clearance to this blade. The next picture shows the ripped 16” strip being checked for size. I usually start with a very small cut into the plank and measure what will be the resulting strip thickness, then adjust the fence if necessary before cutting off the whole strip. This was then repeated for each cut. 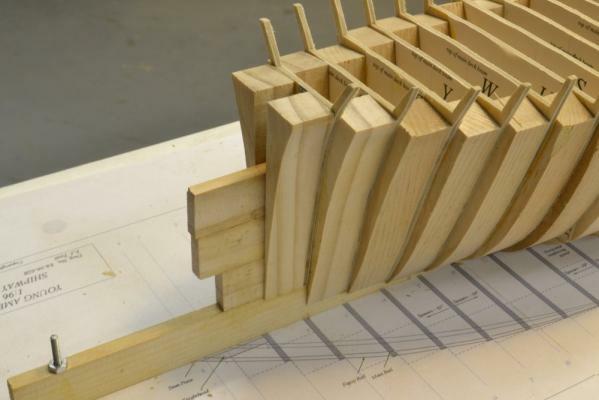 The ¾” strips were then used to make sections of the keel and the other components. 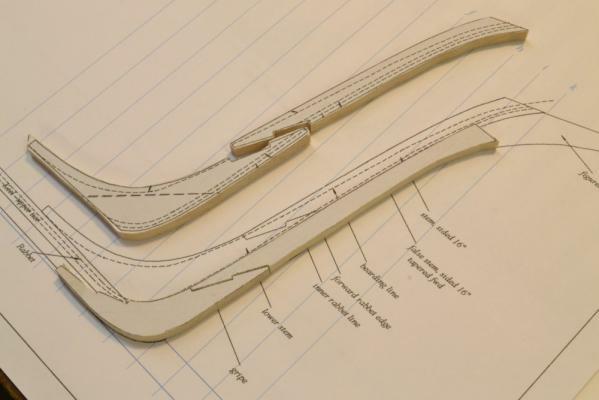 In the next picture the POB stem pieces are shown on a copy of the pattern sheet. All were able to be cut from the ¾” inch stock except for the lower stem as shown above. On the original ship this piece would have been cut from a very large piece of compass timber – probably live oak for strength. 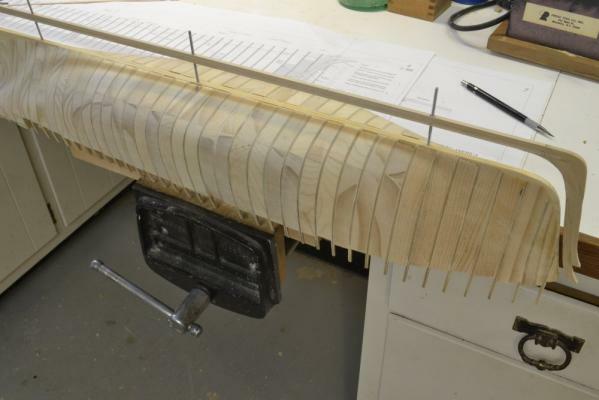 On this model, two pieces of edge-glued ¾” maple were used. The next picture shows the two pieces used for this being edge glued. Undarkened Titebond® was used for this to minimize joint visibility, although on this model all this will be covered by metal sheathing. 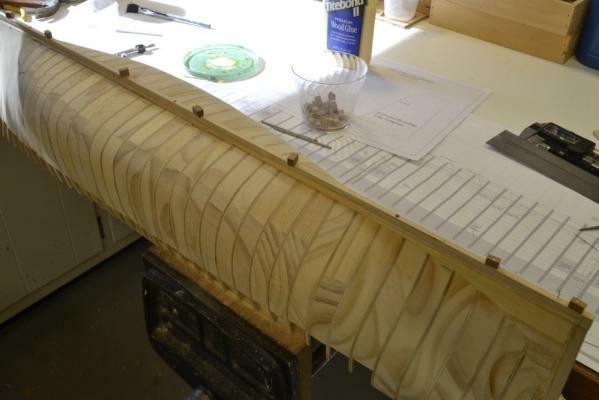 The long straight piece in the picture is being used to make sure the two glued pieces lie flat. The next picture shows the four stem pieces cut out and ready for fitting. Dashed lines around the patterns show ¾” stock. 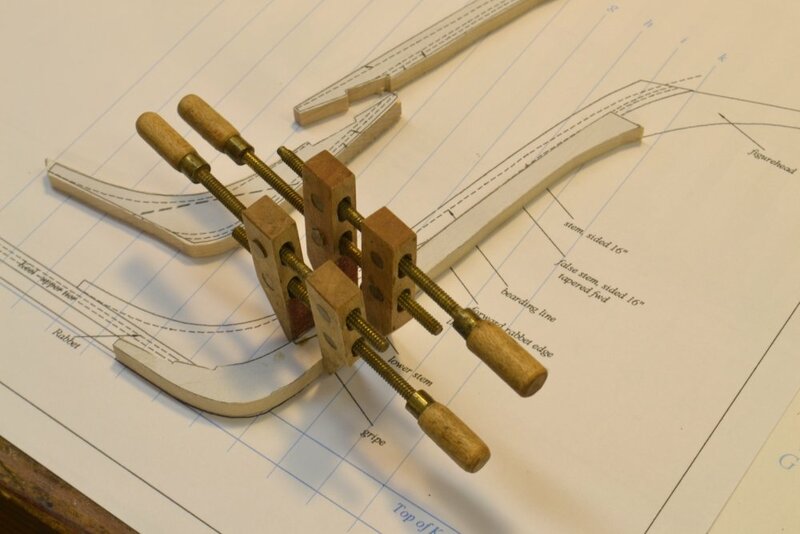 The pieces were cut on the scroll saw very close to the pattern lines, then dressed with a file for final fitting – as shown below. The patterns were left pasted on for all of this work. In the next picture,, the false stem (the members forward of the stem proper) have been fitted and aligned on the drawing. 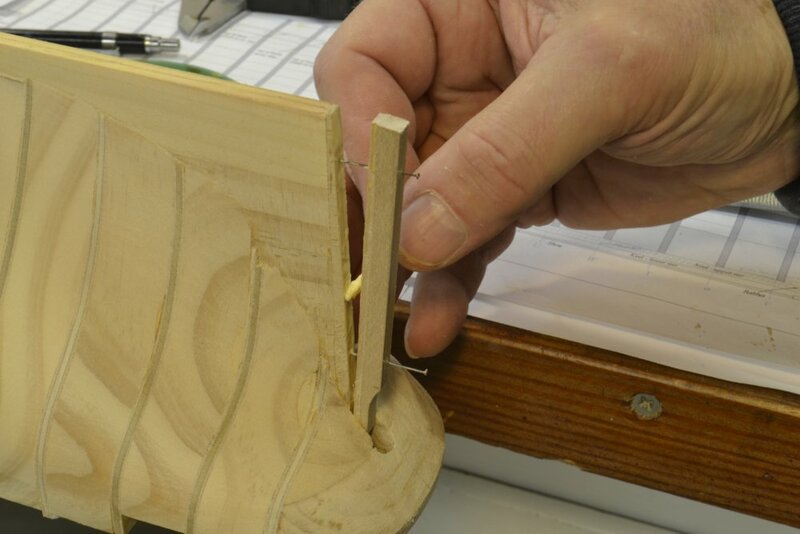 The false stem pieces are being glued in the next picture. The keel for this version of the model was made exactly like the keel on the framed version – in two tiers plus a shoe and with hooked scarph joints – but without the water stops and joint wedges. I did not take pictures of the joinery work. This was described in the posts for the framed version. 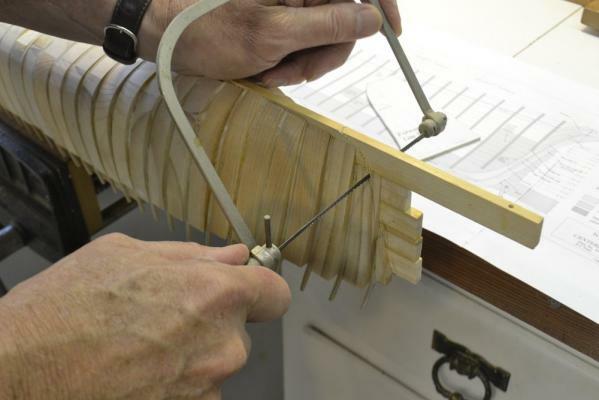 The first picture shows the upper tier being glued together using strips of wood to keep it straight. The pieces of the lower tier are shown below the glued assembly before their joints were cut. 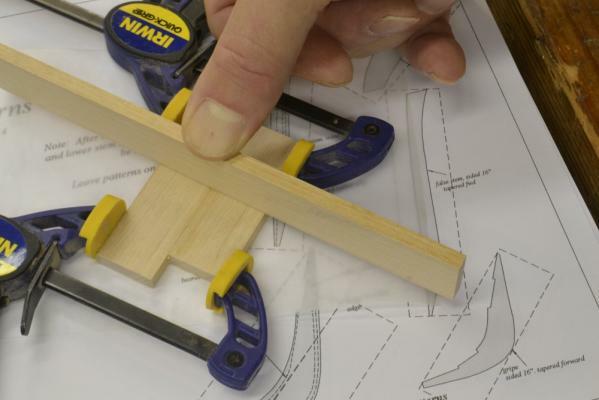 In the next picture the keel assembly with the two tiers and the shoe has been glued to the false stem assembly and the stem is being glued into the angle between the two assemblies. The stem and keel were taped to the drawing to preserve alignment when fitting and gluing the stem into place. The stem provided enough reinforcement to prevent to stem shape from distorting in the next steps. In the next picture the stem/keel assembly has been fit up to the inverted hull for final fitting. It can be seen in the picture that some shaping of the forward hull is needed. This was left rough and slightly large. The station marks accented in the picture were used to get the assembly correctly positioned as the forward curve of the hull was trimmed. In the next picture the fitted assembly has been drilled with mounting bolt holes to match those on the hull and is being test fit. 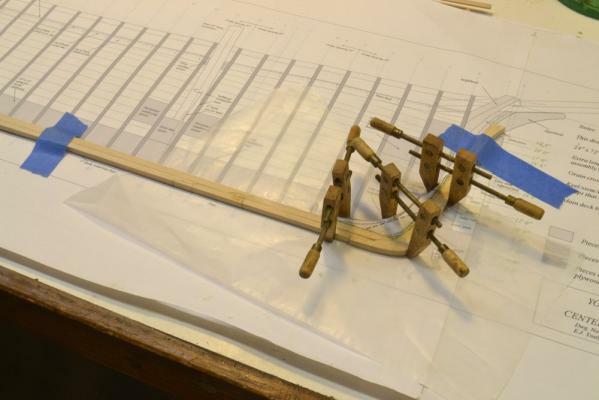 With the stem/keel still unglued, the hull was bolted down on the shipway and plumbed so the stem could be centered. The next picture shows the hull being marked to show the sides of the stem. This allowed the forward deadwood to be trimmed to match the stem while the stem was removed and safe from damage. The next picture shows the fairing to the stem sides. The stem was next refitted and aligned to the marks so locating pin holes could be drilled as shown in the next picture. Before attaching the stem/keel assembly, some additional work was required at the stern – to be covered next time. Before attaching the keel/stem assembly to the hull, the sternpost had to be installed. 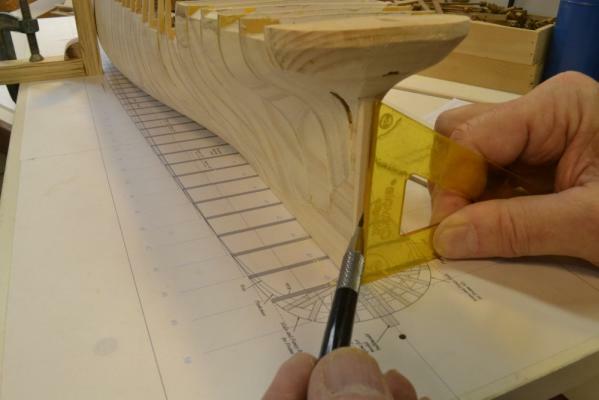 In the first picture a template is being used to check the hull for fitting the post. The template is aligned at station 50. The picture shows the need for a filler piece. In the next picture the hull has been cut back for the filler, it has been installed, and the hull is being checked again with a different template. 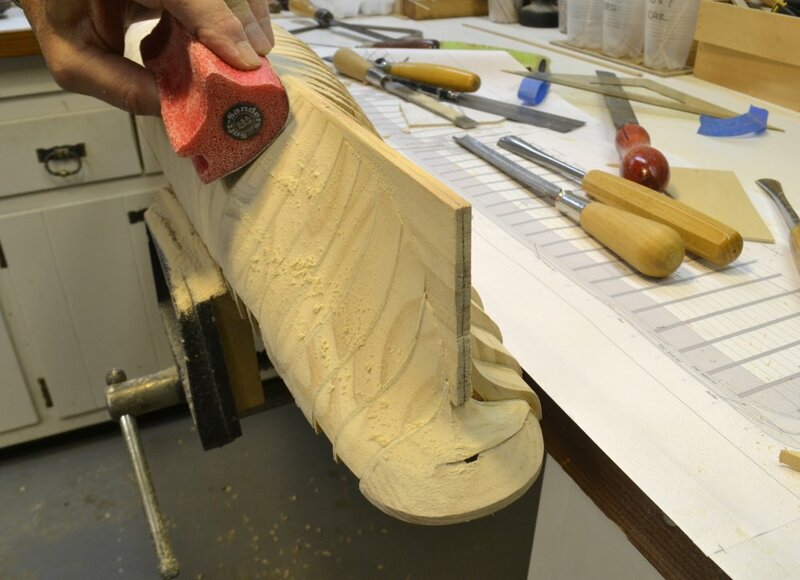 The filler piece provided a straight, flat surface on which to bed the sternpost – assuring a good joint and clean surface for shaping the deadwood into the sternpost rabbet. In the next picture, with the hull plumbed, the sternpost centerline is being marked on the filler. In the next picture the hull has again been inverted and the sternpost is being fit up. Holes for locating pins were drilled with the post in position. The bottom of the post was then cut off flush with the bottom of the hull. In the next picture the sternpost rabbet is being scraped out using the vise as a guide. The rabbet was formed on both sides in this way – all the way to the bottom of the post up to the intersection with the hull at the top. In the next picture the post is being glued to the hull. The keel assembly rabbet was extended only back to the inner line of the post, as shown below, deferring final rabbeting until after assembly. In the last picture the stem/keel assembly is being glued to the hull and held in place with pins driven through wood blocks. The hold down bolts were in position for the gluing/clamping, but were removed to avoid them being glued in. The next step was to fair the deadwood into the rabbets at both ends – next time. Ed - I continue to learn new techniques from you - thanks! 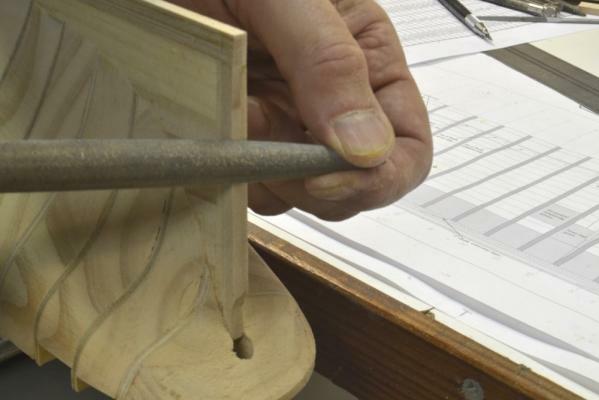 The idea of holding the scraper for the rabbet in a vise rather than the other way around seems like common sense, but I think I would have struggled for a long time before coming up with it myself, if ever! also those Tools are just right to achieve the best results. That hull Looks perfect ! Once the keel/stem/sternpost assembly was installed, the final fairing of the hull into the rabbet could be done. Along the stem and keel the joint with the hull is on the bearding line, so the first step was to fair the hull along this line to meet the thickness of the stem/keel (16”), which is the hull breadth at that line. In the first picture the “hump” on the hull spine is being pared back to match the width of the keel. In the next picture a riffler is being used to produce the final faired surface at the stem. At the stem the area outside of the bearding line must be further pared back smoothly into the stem rabbet that was cut before assembly. In the next picture that is being done with a shallow gouge. 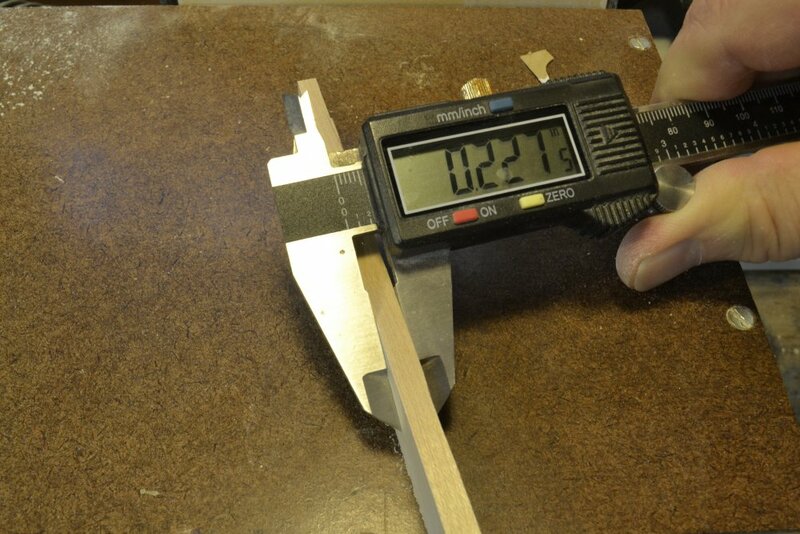 In the next picture the fairness in this area is being checked with a strip of planking. The same process was repeated at the stern – and of course on both sides. The hump along the keel at the stern is being removed in the next picture. Sanding is always the final step. The final sanding of the hull was done using 120-grit paper. With the hull now fully faired the bevels on the aft face of the sternpost were filed off as shown below, while the model was inverted. The post bevels allowed the rudder to swing over its full arc without being obstructed by the post. After this work, the lower hull was ready to be planked. 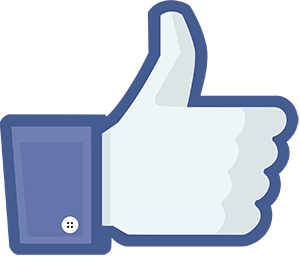 And by the way, thanks again for all the likes and especially the nice comments. Very nice hull, Ed . Your method is completly diefferent from every other methods, I've seen before.